The 2008 Global Financial Crisis persuasively proves that StashAway’s Economic Regime-based Asset Allocation (ERAA) can protect capital effectively through tough times, such as a recession. In June 2008, ERAA would have adjusted portfolios to have limited equity exposure, and with exposure limited to sectors such as consumer staples, and to have stronger gold and fixed income exposure, particularly long-dated. The chart below shows how StashAway’s ERAA would have changed its portfolios before and during the crisis, and how this would have affected a balanced portfolio returns versus the SP500 and versus a traditional 60-40 portfolio. As these were unprecedented volatile times, there were numerous regime changes in a short period of time (3 changes in 14 months). 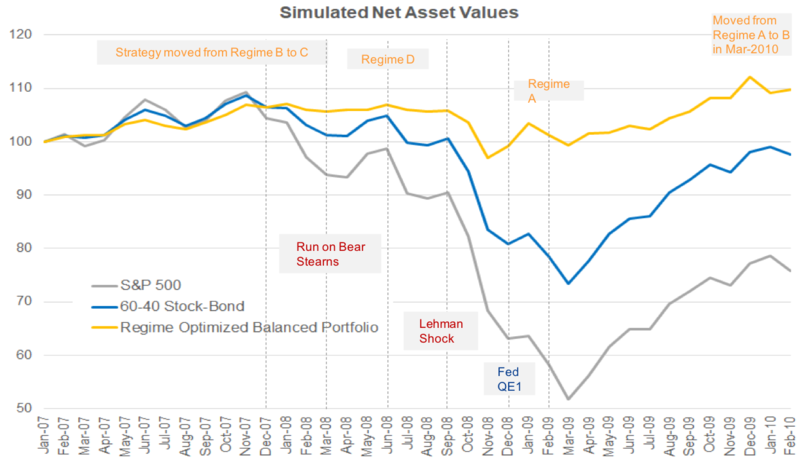 In the 3 years around the 2008 financial crisis, the ERAA-optimised balanced portfolio would have made 11.4% in returns, while the S&P 500 lost 23.2% and the 60-40 stock-bond portfolio lost 1.4%. The benchmark is composed of 60% in stocks (as measured by Vanguard Total Stock Market Index, VTSMX) and 40% in bonds (as measured by Vanguard Total Bond Market Index, VTBMX). ERAA was built to protect StashAway’s investors money during the ups and downs of the market. This article focused on on “Pillar I (Economic Regime)” of the framework. You can find more details on ERAA in this white paper.